For some people, the holidays are a time to relax and unwind, gorge themselves on cakes, cookies, and chocolate, and take long naps on the couch watching re-runs of the 90210 Christmas special. Whatever works for you. Personally, I see it as a time to get down to business and cook some really special food for my family and friends, and sneak in that extra workout (sorry, it’s true). What’s the deal with tempeh? A while back I mentioned that I was trying to cut back on soy products, specifically soymilk and tofu, since they are a very processed bunch of edibles – not what a I would call “whole foods”. Tempeh (pronounced TEM-pay) on the other hand, is quite the ingenious little treat, made from whole soybeans and rice (or another type of grain). It is much higher in fiber than other soy products because it is includes the whole bean. It is also higher in protein than tofu, contains more vitamins and is easier to digest due to its fermentation process, which preserves the nutritional value. Did I say fermentation? I sure did friends and we all know that that means probiotics. Holy cow, could it get any better?! Why the heck does it look so weird? Yeah, yeah, it looks like a cake made of brains, but appearances do fool. To make tempeh, whole cooked soybeans are blended with rice or grains, injected with a culture and fermented for 18-24 hours to form a dense, chewy cake. It should have veins, a gray-ish white, thread-like substance resulting from the fermentation that binds the tempeh together. Black patches on the surface of the tempeh do not indicate spoilage, just that the good bacteria are still at work (trim this part off before cooking). You can find tempeh in the refrigerated section of natural food stores (and often in the freezer). Use it in the recipe below, or as a meat substitute in chili, stews, fillings for potpies, stir-fries – be creative! The only real suggestion I make is that you cook the tempeh a little bit first before adding it to the rest of the dish you’re making. The flavour is not as strong if it is steamed, simmered, or browned before making its grand entrance. And much like tofu, it takes on the flavours that you use in the cooking process. Anyone who says that tempeh is gross is cooking it wrong – it only tastes as bad as the way it is prepared! a few spoonfuls of Green Giant Cilantro Pesto or a handful of cilantro (coriander) leaves. 1. Put the orange juice in a small bowl. Add the grated ginger, tamari, mirin, and maple syrup, ground coriander, and garlic. Mix together and set aside. 2. Cut the tempeh (or tofu) into thin-ish, bite-sized pieces, and if working with tofu, pat dry with a paper towel. 3. Put the olive oil in a large frying pan over medium-high heat. When the oil is hot but not smoking, add the tempeh and fry for 5 minutes, or until golden underneath. Turn and cook the other side for another 5 minutes, or until golden. Pour the orange juice mixture into the pan and simmer for 10 minutes, or until the sauce has reduced to a lovely thick glaze. Turn the tempeh once more during this time and spoon the sauce over the tofu from time to time. 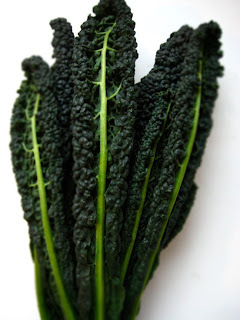 Add sliced kale and cook until just wilted. 4. 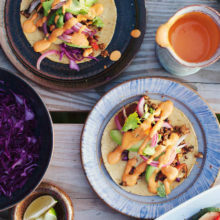 Serve the tempeh drizzled with any remaining sauce and a squeeze of lime, with the coriander scattered on top. Set on top a bed of sweet potato rice (of course, this is optional) or use any other cooked grain you have on hand. 1. Rinse rice very well until water runs clear. Put in pot with 2 cups pure water and salt. 2. Scrub sweet potatoes well (leave skin on for maximum nutrition!) and chop into small cubes. Slice garlic roughly. 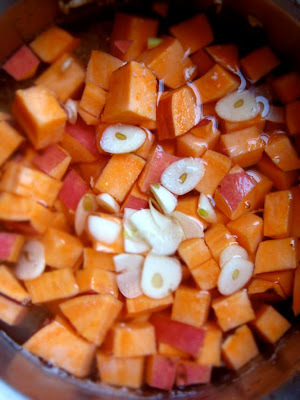 Add sweet potatoes and garlic to rice pot. 3. Bring pot to a boil, reduce to simmer and cook until tender 45-50 minutes, typically. Don’t be a wuss. Go get some tempeh and try it. Right after your aerobics DVD is over. We had this for dinner yesterday (with tofu as unfortunately I couldn´t find any tempeh) and it was delicious! Definitely a keeper, thanks for that. I also love the sweet potato / brown rice / garlic combination! i actually prefer tempeh to any other soy product, it has more interesting taste and texture to it. any idea where in mtl i would find tempeh? health food stores? i was actually looking for it the other day in the grocery story but couldn’t find it.